Pasta is a staple food of traditional Italian cuisine, which comes in many forms. 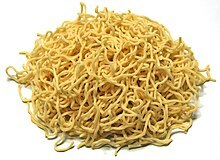 Typically, pasta is a noodle made from an unleavened dough of a durum wheat flour mixed with water or eggs and formed into sheets or various shapes, then cooked by boiling or baking. 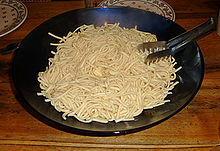 However, it is often disputed whether or not pasta classifies as a noodle in common speech, or if there is a distinction. This page was last edited on 24 January 2019, at 17:25 (UTC).